The trial operation of the Sodar-based Low-level Wind Information (SOLWIN) system has started at Tottori Sand Dunes Conan Airport (Tottori Airport) for one year from August 1, 2018. SOLWIN was jointly developed by Sonic Corporation and JAXA through JAXA’s Open Laboratory Scheme. 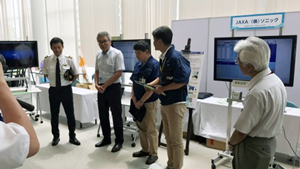 Prior to conducting trial operations, JAXA made a presentation of SOLWIN at the grand opening event of the Tottori Airport on July 28, 2018. The SOLWIN can provide wind advisories to pilots and airline operators regardless of weather conditions by observing winds up to 90 meters above the device using the Doppler Sodar (sonic waves). Through trial operations conducted at Oita Airport in FY 2017, SOLWIN was highly evaluated by pilots both in terms of its observation accuracy and effectiveness of information provision. In addition, the report compiled by the Association of Air Transport Engineering and Research also determined that the SOLWIN is effective to reduce the impact of low-level winds for safer aircraft operation. For practical implementation, we need to evaluate the SOLWIN at various airports which suffer strong winds and/or snow. As winds from the Japan Sea blow into Tottori Airport, where snow falls in winter, we are expecting to collect more data for the SOLWIN operation in a harsher environment. We are also under negotiations with airports in other regions. By incorporating more data from various weather conditions, we aim to make SOLWIN more sophisticated and practical system.